My grandma had her birthday on the 5th of July and I made her a present. So here is a little story about all of that. My grandma is a person who teached me to knit back in my childhood. 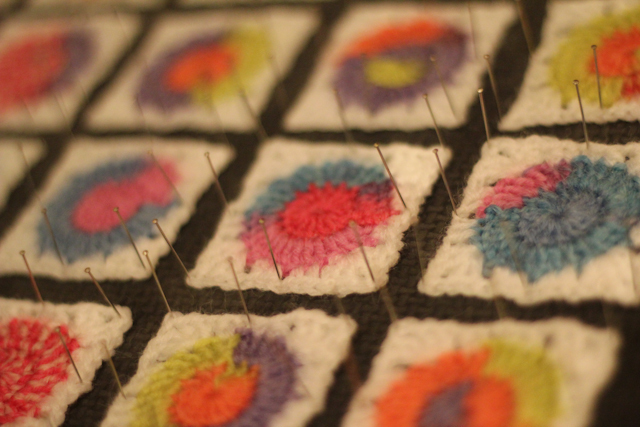 She was doing a lot of sewing, knitting and embroidery and even now she still is making cross-stitch, despite her age, pains in her neck and bad eyesight. So we ( me and My Little Man) went to the wool shop to pick up some yarn for the project. I decided to let him pick the colours for his grandgrandma. And all the colours he was choosing were pink or a mix of pink with something else. And it wasn't some dusty pink or purple pink, noooo it was really bright pink, pinky pink, I would say. In the end we agreed to take a colour changing yarn, that had pink in it, but some other colours too. 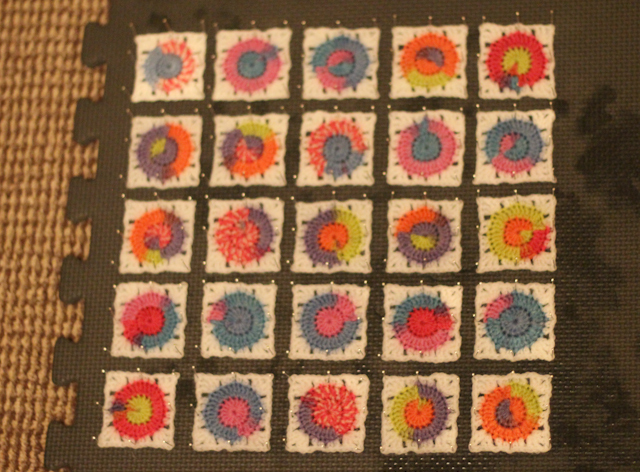 In the process of crocheting I discovered that in DK that I was using the cussion would be too small, so I had to make 5x5, not 4x4 squares as in the original pattern. I also changed the back and just made it plain white with treble crochets. 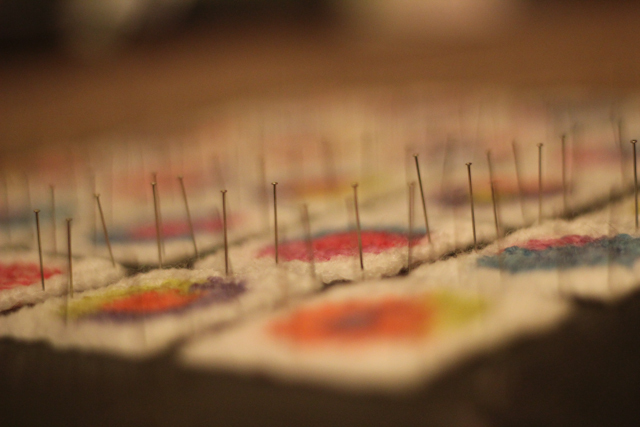 Then I had to soak all the squares in the water, pin them to a water resistant surface and let them dry naturally. It was actually a good thing to do so the squares would really look like squares. Then I joined them together using this method from lovely Lucy from Attic24, added the back part and inserted a cussion inside. 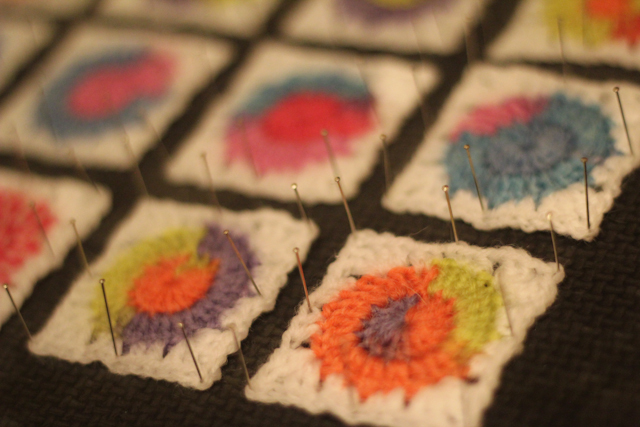 About the pattern - it's really easy and, even working slowly, you could finish this in a couple of days. But, if you are going to use double knit yarn like I did, I would advise to make it 5x5 squares, otherwise you'll end up with a really tiny cussion. When are you coming to Riga? I have a plenty ao plans for august, so, please, write me back, when something will be clear, so I will be able to organize my plans and take some days-off. A big summer tote I designed for a wool shop.